In many ways, Cristiano Ronaldo represents what's good about footall: The work and dedication he put into becoming one of the world's finest footballers, is certainly a role model young footballers should follow, as well as his determination to succeed. This is an article i picked up from "Bleacher Report" website, so please bear in mind it has a very high subjective and personal point of view from the author. The interesting fact is, the author is in fact a Barcelona fan, so his opinion just shows how Cristiano Ronaldo's talent and dedication can also be appreciated by those who are supposed to dislike him by nature. 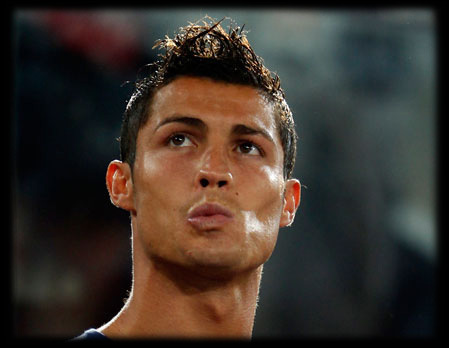 Once again, the article wasn't written by ronaldo7.net; the author name is Manuel Traquete. This is Cristiano Ronaldo in a nutshell. Things haven't been going well for the Spanish giants lately. After Gonzalo Higuain's injury, Benzema has been the only pure striker available for José Mourinho. After an impressive start to the season (except the blowout defeat at Camp Nou), Real Madrid suddenly started struggling to win their matches and eventually tied 1-1 at bottom side Almeria, which means that, at the end of the first half of the season, they're already four points behind record-breaking leaders Barcelona. Mourinho has been quick to blame the referee for the shocking result, as well as the lack of a "9." But while whining has been the "modus operandi" around the Santiago Bernabeu, there has been one man whose attitude has been completely different: Cristiano Ronaldo. It'd be an understatement to say that Cristiano Ronaldo has been an important player for Real Madrid this season: With 22 goals in La Liga and 31 in all competitions, the Portuguese forward has been nothing short of decisive; it's mainly thanks to his immense contribution that Real Madrid are only four points behind Barcelona at this point. It's not just his goals that stand out, but his incredible attitude on the pitch: Cristiano Ronaldo is a man on a mission. He's determined to finally justify his $94 million price tag and lead Real Madrid to the glory that has eluded them in the past decade. His total commitment and never-say-die attitude were well apparent in his third goal against Villareal a week ago: He fell, he got up, he scored and Real Madrid won the match. But Ronaldo's attitude has been like this ever since the start of the season; even when things don't go so well, he sometimes seems like the only Real Madrid player who's actually trying to change things. Last Sunday, he forced Almeria's goalkeeper to make some great saves and hit the crossbar in the last minute. If anyone can be blamed for the draw, it's certainly not Cristiano Ronaldo. Even in the manita at Camp Nou, Cristiano Ronaldo was one of the few Real Madrid players who tried to stop the blaugrana onslaught. But of course that, while he alone can make an impact against the minnows in La Liga, he cannot do the same against Barcelona. Real Madrid have developed a worrying dependence on Ronaldo for goals. The Portuguese has scored almost 50 percent of Real Madrid's goals in La Liga (22). The second top scorer is Gonzalo Higuain with just seven goals. This is a clear contrast to what happens at Barcelona: Lionel Messi has scored 18 goals, but Villa has 14, Pedro 10 and even Iniesta has six. With so many prolific scorers, Pep Guardiola has even rested Messi a couple of times. Even without the best player in the world, Barcelona won their matches. But can Mourinho rest Cristiano Ronaldo? Simply put, no. And he knows that pretty well. In fact, Ronaldo is the Real Madrid player who has played more minutes this season, even more than Iker Casillas. In La Liga, the Portuguese has played every single minute of every match, which is truly impressive. He has been playing nonstop and always at a top level. While he might not have the class of some Real Madrid legends of the past, his unconditional commitment to the madridismo cause and his obsession with winning and becoming the best make him a true hero at the Santiago Bernabeu. Ever since he was signed from Manchester United, Ronaldo scored a disbelieving 64 goals in 64 matches, a unique goal ratio in Real Madrid's illustrious history. Every manager who has coached Ronaldo hailed him as the hardest working player they had ever seen: he's always the first to arrive for practice and the last one to leave. When you combine this with Ronaldo's natural talent, you have one of the best players in the world. There are many supremely talented footballers around, but how many of them took the time Ronaldo did to build his physique and improve on every aspect of his game. There's this unfounded assumption that Cristiano Ronaldo represents everything that's bad about football. Many are put off by his diving, but this really seems like hating for hate's sake. Every top player dives sometimes, and they're still top players. In many ways, Cristiano Ronaldo represents what's good about football: The work and dedication he put into becoming one of the world's finest footballers is certainly a role model young footballers should follow, as well as his determination to succeed. If his teammates at Real Madrid followed his example, Real Madrid fans would certainly have a lot more reason to be optimistic... Right now, Cristiano Ronaldo is carrying Real Madrid almost single-handedly but, as great a player as he is, that will not be enough for Real Madrid to collect trophies. Unless his teammates step up, Ronaldo seriously risks another trophy-less season at Real Madrid, despite his excellent individual exploits.